Kasper Holten's production of Tannhäuser is an interesting reading of the story set in the 19th Century in an atmosphere that evokes Strindberg and Ibsen. Tannhäuser is torn between his mission as an artist (the Venus world) and his obligations as a husband and a father (Elisabeth's world). The Rome narration is his own retelling of the work of fiction he has written during his absence in "Rome". 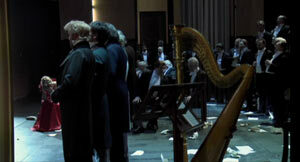 This is very innovative and surprising, and provides a fresh perspective of the opera. Kasper Holten's strength is in the details. He is always attentive to nuances in the music, and generally the Personenregie is among the best of the opera world today. And he obviously has an abilty to inspire strong dramatic interpretations from his singers. None of the singers excel vocally in this production, although four principals, Stig Andersen (Tannhäuser, Tina Kiberg (Elisabeth), Susanne Resmark (Venus) and Stephen Milling (Hermann) are all at least acceptable. The chorus is far below par, seldom sounding as if they are a unified group. The orchestra's performance is marred by an odd balancing of the instrument groups and by uninspired playing under conductor Friedemann Layer. So, musically the DVD seems more the product of a provincial theatre, except for the aforementioned principal singers. Unfortunately the opera as a conflict between art and family life reduces much of the tension in the music and in the drama. The story fails to convince the viewer that much is at stake here. I found it difficult to relate to the drama as Holten presents it. 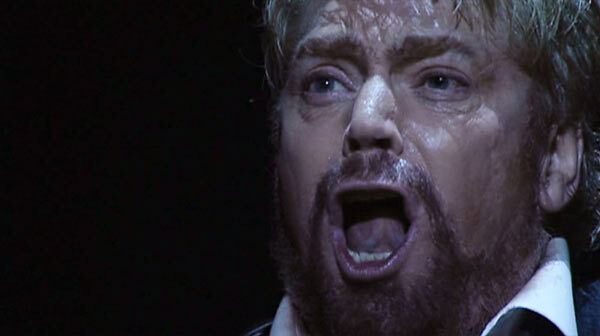 In reality Tannhäuser's conflict - no matter how it is interpreted - is a matter of life or death, of redemption or hell. In a way this production is metatheatre that does not dare to fully embrace this idea. In my opinion, the concept needs some ironic distance. As filmed opera I am sad to say that the DVD is very inferior with lots of filming from meaningless angles (the shots from floor level are visually a disaster). That said, a lot of the close-ups and fast editing work very well, suiting Holten's claustrophobic one set vision. As a final note it would be interesting to hear Cubus Film and TV editors Peter and Uffe Borgwardt's explanation of what on earth they were thinking of editing DVD 2 at 1:31:10 and 1:32:30 where they used the same shot twice of Wolfram putting a blanket over Elisabeth right before he sings "Wie Todesahnung, Dämm'rung deckt die Lande". This is as bad as video editing can get.